The term "stained glass" has been used loosely over the years which has caused a lot of confusion for many laypersons. Over the years, it has been used to refer to art glass, colored glass, favrile glass, cathedral glass, double-roll glass, dalle de verre glass, opaque or opalescent glass, etched glass, colored plastics, or colored fiberglass along with many others. Traditionally, stained glass referred to leaded colored glass (or cathedral glass) that has a layer of stain baked into the glass. This type of glass is in many of the European cathedrals built during the Middle Ages. At Laws Stained Glass Studios, we refer to this type of glass as "hand-stained glass" or "hand-stained pictorial glass". The stain or paint is fused with the glass so that it will not fade, chip, or peel off. With stained glass window that is properly baked, you should be able to scratch it with a piece of metal like a coin and not be able to remove the stain or paint. In the Middle Ages, sometimes they did not apply stain to the glass. They just used the colored glass to make a leaded design. Colored, transparent glass is referred to as cathedral glass. This glass can be hand blown or machine manufactured. Cathedral glass that is machine fabricated is called "double-roll glass" which refers to the way it is produced. Lay people unknowingly lumped cathedral glass and "hand-stained" glass together and called them both "stained glass". Around the 1870s and 1880s, John LaFarge and Louis Comfort Tiffany began producing glass that was not transparent like the cathedral glass. They mixed a milky white glass with colored glass which made an opaque or semi-opaque glass. Tiffany called his glass favrile glass. This type of glass is still manufactured today and is called opalescent glass. It can vary in the amount of opaqueness and of course colors and texture. Like cathedral and hand-stained glass, opalescent glass is 1/8" thick and is leaded together to make a window. In the 1950s and 1960s, another type of glass was produced called "dalle de verre" glass, slab glass, or faceted glass. This glass is about 1" thick. The pieces of glass are chipped or faceted and then arranged in mosaic pattern. Epoxy resin is poured in between the pieces and allowed to hardened. C. A. Laws was one of the first stained glass artisans to begin using this type of glass. Shortly thereafter, people began lumping faceted glass into the definition of "stained glass". At Laws Stained Glass Studios, we will loosely call all of the above glass (hand-stained glass, opalescent glass, cathedral glass, & faceted glass) "stained glass" because it all is made of some type of colored glass. Note that over the years different studios or companies have laminated (or glued) these types of colored glass to 1/8" double strength glass or 1/4" plate glass, but the result was a product that could not be repaired or maintained for a significant period of time. Properly built and protected leaded or faceted glass windows will many times last anywhere between 75 to 150 years without needing much upkeep. (Kind of like properly-made bricks or steel for a building.) The colors of stained glass windows do not fade over time. In the 1960s or so, some church furnishings began offering a cheap alternative to leaded glass windows called krinkle glass. Krinkle glass is fiberglass that allows some light to shine through it. Most of the time, the krinkle glass is only about 1/16 to 1/8" thick which can easily be punched through with a fist. Some of the krinkle glass windows would have symbols imprinted onto them. In addition to being very thin and weak, the colors of the krinkle glass fade over time. Krinkle glass is not "stained glass". Click here for a job where we removed Krinkle glass to install leaded glass windows. 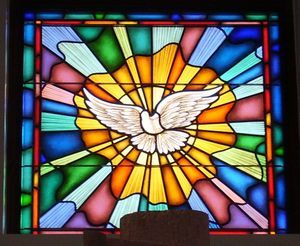 With the advent of computers, printing or sign companies have sprouted up that begun to dip into the "stained glass" window market. They have a computer, a camera, and a plotter (a large format printer). They take pictures of existing stained glass windows and print them onto plastic film (some call it "polymer glass") like the big plastic stickers on fast food restaurant windows. Sometimes they will laminate or glue the plastic film to a piece of glass or a thicker piece of plastic. These are called stained glass inserts or stained glass overlays. These are made of printed inks that will surely fade over time even though they are called permanent inks. New inks are being made continually, but none have been tested for an extended period of time like 50 or 100 years because they have not existed that long. Stained glass inserts or stained glass overlays are not "stained glass". What is NOT "stained glass"? At Laws Stained Glass Studios, we will loosely call hand-stained glass, opalescent glass, cathedral glass, & faceted glass "stained glass" because it is made of some type of colored glass. Note that over the years different studios or companies have laminated (or glued) these types of colored glass to 1/8" double strength glass or 1/4" plate glass, but the result was a product that could not be repaired or maintained for a significant period of time. Properly built and protected leaded or faceted glass windows will many times last anywhere between 75 to 150 years without needing much upkeep. (Kind of like properly-made bricks or steel for a building.) The colors of stained glass windows do not fade over time. In the 1960s or so, some church furnishings began offering a cheap alternative to leaded glass windows called krinkle glass. Krinkle glass is fiberglass that allows some light to shine through it. Most of the time, the krinkle glass is only about 1/16 to 1/8" thick which can easily be punched through with a fist. Some of the krinkle glass windows would have symbols imprinted onto them. In addition to being very thin and weak, the colors of the krinkle glass fade over time. Krinkle glass is not "stained glass". How long does a leaded stained glass window last? - Sections are not over 15 square feet. - The windows have plenty of steel braces - every 9" to 12" horizontally. - The lead came is of high quality & not refurbushed. the perimeter stops, or a metal (steel or aluminum) frame is used. What are bulges in stained glass windows? Over time, leaded glass windows may bulge to the interior or exterior which is ultimately caused by the force of gravity. Properly constructed windows with the appropriate steel braces, staggered borders, appropriate size panels, necessary framework, etc. should not have any major bulges for years to come (50+ years). Older windows with exposure to the elements or excessive heat may have bulges sooner. Click here for more information and pictures. Why does the protective covering yellow and discolor? Not all protective covering discolors or yellows. If your protective covering is discolored, then you have a polycarbonate installed. Polycarbonate is a plastic that reacts with ultraviolet light causing the milky white or yellowing look. Lexan which was first created by General Electric is the most common brand. Other plasics like acrylic do not discolor and, many times, provide a better alternative. Click here to see photos and read more. Cementing is the process of waterproofing and sealing a leaded glass window with a putty mixture. The putty is worked in between the lead came and the glass. Re-cementing is the process of applying the cementing mixture to the outside of an old leaded window usually while it is in place. Re-cementing many times is unnecessary and can cause undesired effects. Click here to learn more. What will it look like if I change the color of our frames from white to dark bronze? Here is a job in Jarratt, VA where the existing windows had white wood frames. These frames were covered with heavy aluminum framing material that was dark bronze. And the new aluminum frame was dark bronze. This is a traditional hand-stained, leaded glass window that stained and painted by European studio. Laws Stained Glass Studios re-sized this old window to fit in its new location. Close-up view of a poor and sloppy re-cementing job done by another company. The extra cementing mixture detracts from the window and provides little use.